The surfaces of three of the ossuaries were roughly dressed with a chisel. Dissimilarities in the scoring patterns left by the chisel marks indicate that a different chisel was used for carving each ossuary. These three ossuaries were also similarly and beautifully inscribed and were readable without additional lighting. The names MARIA, YOSEH and MATTIYAH were deeply inscribed with beautiful large letters (2.5-3 cm high and 1 to 2 mm deep) by a practiced, almost certainly professional, scribal hand. On the spot, and without any further need for examination, it appeared that all three may well have been inscribed by the same individual. They all contain similar features including open heads or serifs on the letters in the common lapidary script of the day (engraved on stone buildings, plaques, ossuaries as well as metal plaques and scrolls), yet each with a peculiar individual style similar to the other two. Of the other, less than twenty ossuaries that are written in Hebrew lapidary script in the State of Israel Collection (L. Y. Rahmani, A Catalogue of Jewish Ossuaries, Israel Antiquities Authority and the Israel Academy of Sciences and Humanities [Jerusalem: 1994]) and Dominus Flevit collections, few are as beautifully and well inscribed as these. Curiously, in all three cases the names that were used were common abbreviated forms of a known Jewish name. MATIYAH (for MATITIYAH); Rahmani 703. Translated: “Mattiyah” or “Matthew”. The space between the left downstroke and the horizontal head of the letter heh first starts to appear during the first century, but only in lapidary script, intermittently, on ossuaries and in the Copper Scroll. It is unusual that it is found on three of the six inscribed ossuaries from this burial cave (Rahmani ossuaries 702, 703 and 705). This space does not become an essential part of the letter in the written pen and ink scripts for yet another few centuries. This inscription was added to the side of the ossuary where it would be readily visible if placed in one of the loculi. MT[Y]H (First two letters are cursive) was lightly inscribed on the interior. This was likely done by the stone mason or a family member to assign the ossuary to this individual before the permanent inscription was added to the exterior of the box. Another ossuary, CJO 42, bears both the formal name and the nickname of a single individual named “Matthew.” Again, the temporary inscription was first written with less carefully executed letters, some in cursive style, on the back of the ossuary. But the permanent inscription was written on the front, decorated side of the ossuary. YOSEH (for YEHOSEPH); Rahmani 705. Of these three inscriptions, this one makes the widest use of the open headed serifs. YOSEH (sometimes transliterated Jose) is a shortened form of the name Yehoseph/Joseph and, although it is found only once in the Hebrew section of Rahmani’s catalogue, the Greek form of the name is found an additional three times. The filmmakers failed to clarify that “Yoseh” (Hebrew) with its equivalent “Iose” (Greek) is by far the most common shortened name for Yehoseph/Joseph from the second century BCE until the first century CE (cf. Yoseh b. Yo’ezer and Yoseh b. Yohanan, the first of the “pairs” who established and ruled the first Sanhedrin in Jerusalem). In second to third century Beth Shearim, among the Greek inscriptions, the name “Yoseh” (7x) is actually more common than “Yoseph” (6x). The New Testament provides both of these names for Jesus’ brother (though Yoseh/Jose occurs in Mark only). MARIA (for MARIAM); Rahmani 706. The first letter “M” is somewhat unusual in that it is a “final form” of the letter normally reserved for the end of words. This is not unique and may or may not have been accidental. 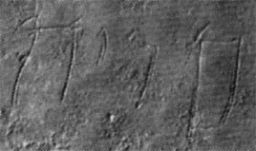 The exact same combination of letters for “MARIA” was found by A. Kloner on an ossuary from the Giv’at Hamivtar district of Jerusalem. (Rahmani, no. 428, ).